I typically like to use fresh ingredients, but I feel like ranch is calling out for dried herbs and pantry staples. There’s something very American about throwing everything into a blender and making dip happen. I use a one two punch of tofu and cashews for the creamy base. Place cashews, water, tofu, lemon juice and agave in the blender. Puree until very smooth, scraping down the sides with a spatula often to make sure you get everything. This can take up to 5 minutes depending on the strength of your blender. Add the onion powder, veg broth powder, garlic powder and salt, and pulse to combine. Transfer mixture to a bowl and mix in the dried dill. Taste for salt and seasonings. Seal tightly and chill for at least an hour. The longer you let is chill, the firmer it will get. Before serving, taste one last time and adjust seasonings as needed. Serve! This looks great! I have a friend who is allergic to soy–is there a substitute for the tofu? More cashews? Thanks Isa — this looks wonderful! I feel like every recipe that calls for tofu should give a link to the type of tofu it’s referencing. I can buy extra firm silken tofu like this stuff (http://www.morinu.com/product/tofu.html#8), or I can buy water-packaged extra firm tofu like this stuff (http://recipepapa.com/wp-content/uploads/2010/07/extra-firm-tofupapa.jpg). I can also buy various other kinds that say extra firm, firm or super firm which will all give me varied results. I’m guessing since this is a dip, I should use the extra firm silken tofu (in the tetra pack), right? If it were very important which kind you use, I would reference it. I didn’t use the tetra pack, I used water-packed, but any of them will work. Even soft tofu will work here! Dips are pretty flexible. I was just going to search on the internet for Ranch Dip and then you posted this recipe. I can’t wait to try it. I miss Ranch Dressing for dipping veggies. My omni husband has been requesting ranch, I can’t wait to try this and if it keeps well maybe I’ll serve it at the wedding!!! I love how easy this sounds. Must try it! Thanks! Sounds and looks great! I’m going to make it soon! you have no idea how happy i am to see this recipe. I have yet to make a good “ranch” dressing and my vegan pizza has been in need of a dip partner…so thrilled!! The cashews are soaking as I write…and thanks for the name, much appreciated (names are important). What kind of broth powder do you use? I’m soaking my cashews too! I can’t wait to make this one. I enjoy Vegenaise every now and again, but it’s nice to see a vegan ranch without it. I am a ranch fanatic, and am always trying to find the perfect dip/dressing to relive my childhood memories. Cannot wait to give this a shot!! some broth powders are gross, can you tell us what you like to use? thanks for all you do and all your magical recipes! Sure! I use Frontier usually. No fair! I’m pregnant and now all I want is some chips and dip! I can’t remember the last time I had something like that. I was a hero last night for making this to eat with artichokes! Husband loved it. Thanks for my new standby dip recipe. How long will this ranch dip keep in the fridge? Hi Isa, wondering if this is raw cashews? I keep meaning to ask that when you post a recipe with cashews. Thanks for coming up with this. I do miss Ranch dressing. And I love that you named it after Gene. They don’t have to say “raw.” As long as they don’t say “roasted” the cashews will work. I made this with raw sunflower seeds and it is delicious. Not as smooth as I wish it was, but I attribute that to the terrible $1 food processor I have. Either way, huge freaking salad for dinner tonight with sanctuary goodness. Again, a recipe that looks so delicious. Mouthwatering!! Made this for Memorial Day, it was a hit! Will definitely make it again. Simone, I haven’t tried this particular recipe, but usually white beans in place of tofu will work in something like this. That’s how I’ll make it. :O This is just in time! I’m having a bunch of people over next weekend to watch Mega Shark vs. Crocosaurus and was trying to think of some fun snacks. I’m definitely making this! Yay! This is actually great as a topping too (isn’t any dip great as a topping ;)) with pasta or rice. Thank you! How do you use the beans? I would LOVE to replace the soy with that!!! Has anyone made this with something replacing the agave? I never use agave and don’t want to go out and buy some just to use a teaspoon of it. This is great! I love how your recipes are so versatile and substitute-friendly. Even if I don’t have all the ingredients, I try it anyway to see what happens and it has always turned out well. For this one, I didn’t have lemon juice so I used sauerkraut liquid and less salt. I left out the agave, on accident, but it’s still good! Thank you so much for all the work you do on your blog. I’m new to vegan cuisine and thanks to you, more and more of our meals are vegan. Thank you so much! I’m so happy that my recipes are helping you out. I can’t find vegetable broth powder (only boullion, which I think would be too salty?) Is there something that can be used in its place? This is such a yummy summer dip! Made it last night with a veggie boullion cube and omitted the salt and it turned out great, was perfect with pita chips. I used a food processor, and mine was grainier than the picture. Next time I will probably use a blender, but my boyfriend who is non-vegan loved it:) Thanks for another awesome recipe! I’ll be using soaked oat bran instead of tofu. 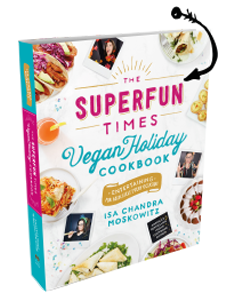 I’m assuming that the tofu is in this recipe for binding? A good oat mash is usually great for a binding. Left it in the fridge overnight, woke up this morning and it’s thin and runny. What did I do wrong? YUMMY!!! Ranch is like crack to me. Thanks for the best vegan ranch dressing ever! sounds delish! can’t wait to try! i love Frontier’s Chickenless Chicken Broth powder!! Yum yum! How did you get your dip to be so white?? Mine is a darker and looks less like traditional ranch dip. It’s still nom-rific on carrots and ruffles, though! Hmm, I didn’t do anything other than what’s in the directions! Maybe it’s the tofu I used, which is homemade at the co-op where I bought it. Oh well!!! My man and I massacred the dip last night when we made it home from the bars. Thanks for the great recipe! I made the recipe from AFR today and was extremely satisfied with what I ate. I was even thinking that it would be good with cashews and lemon juice, so I imagine this version would also be quite tasty. This is so good Isa! 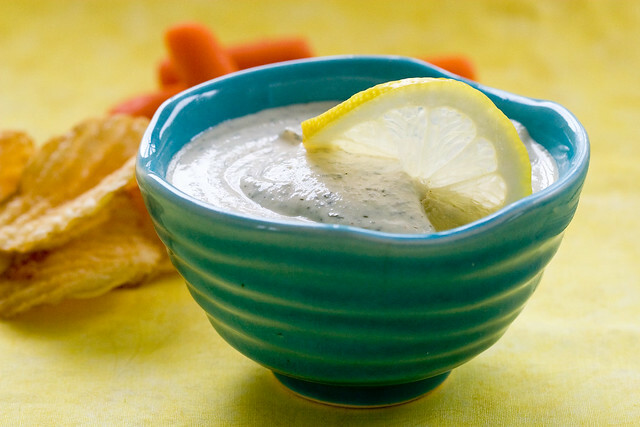 I’ve been eating more veggies-as-snacks with this dip. You’re my prime example of someone that followed their heart and is changing the world. Thank you for sharing your gift. We’re going to try this on a BBQ’d pizza tonight… I can’t wait! This was so good!!! I used fresh garlic just because I didn’t have the garlic powder, it worked fine. Thank you!! sincerely, a pregnant girl who was craving this exact tasting ranch. Hee, glad i could help! Thank you for creating this! It is so nice, I have it with veggie sticks and also as a topping for baked potatoes and salad. Every one of your recipes has worked out perfectly, I think you are a genius. Vegan cooking can be tricky but you nail it. My omni family tried it and loved it, couldn’t tell it was dairy free. Just made this for the second time. Switched out the dill for a tablespoon of chili powder and a couple slices of jalapeno for a Southwest Ranch. I love both versions! Keeping this in regular rotation. Thanks for the recipe that looks so delicious.